Hi Folks and a happy new year to you all. I was having a look at the "City Bug" website (Not a member but it's nice to have a look) and I came across a great little tip from "Steve107" on there. 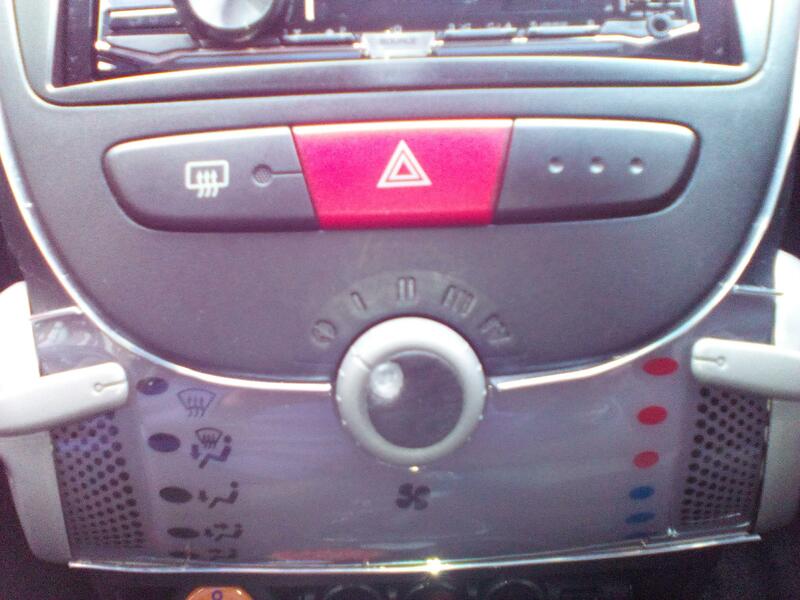 You know the heater/fan speed knob on the centre console? 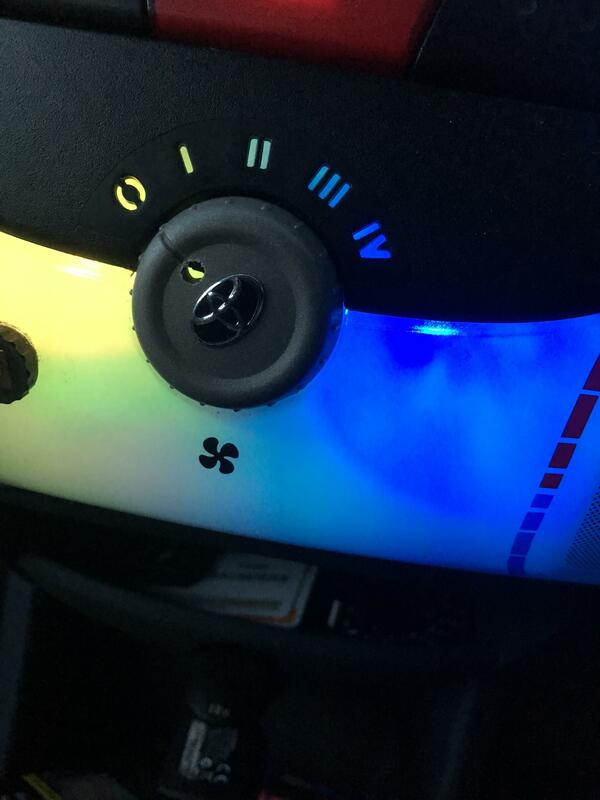 Well it has a groove/indentation on it to indicate what speed the fan is running at and at the bottom of that it has a little dot, if you drill that dot out then the heater lights (that big white area ) show though the hole to give you a (sort of) illuminated heater knob. I just thought that it was a brilliant idea and I'm going to do it, as I say, I'm not taking any credit for it (Nor is Steve107, by the way) but it has to be a little tip that's worth passing on. If you are a member or a lurker on here, Steve, then thank you for a great little tip that costs absolutely nothing. haven't had a look but if I understand what you are saying then you could take it further & put a bit of translucent (coloured?) plastic rod into the hole - would probably look a bit more "factory" than leaving a hole. @Heidfirst Hi Scott, now that is a good idea! My Wife does a lot of "crafting", you know the sort of thing, glass painting, hand made cards and the like so she has all sorts of bits and bobs that might do the job. If I find something, then before I drill a hole, then I'll know the right diameter as I'm all for a more "factory" look. Many thanks! 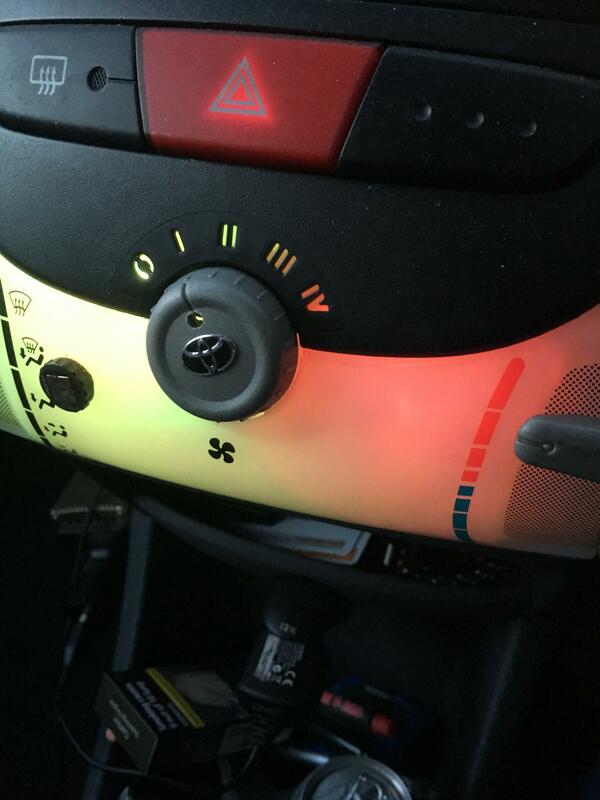 @fordulike Hi David, I'm totally with you on that, surely Toyota could have addressed this themselves as it is such a simple thing but one that makes all the difference when driving at night. When I've done it, I'll tell you how it looks and works but I'm sure that it will be better than it is now......Fingers crossed, eh? 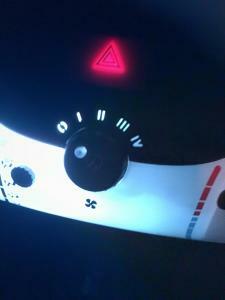 Yes it lights up in all the positions as it takes it's illumination from the centre console lighting. The I,II,III and IV markers are also holes in the fascia and so they are lit up in the same way, straight from the production line. 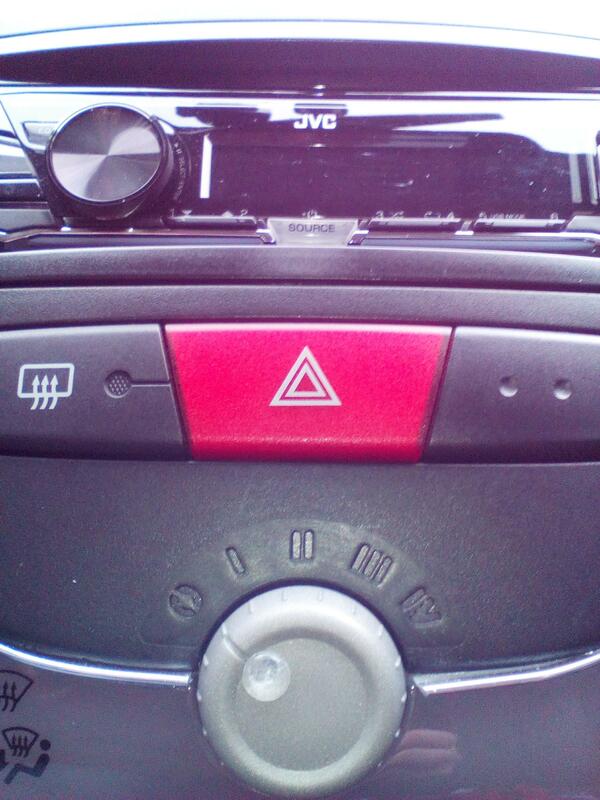 It really is a simple and clever little mod, like I said, I can't take any credit for it but I do like it. All the best.....Go on, get your drill out!!!! My Wife took over the ship and had another go, she used a black bump stop. 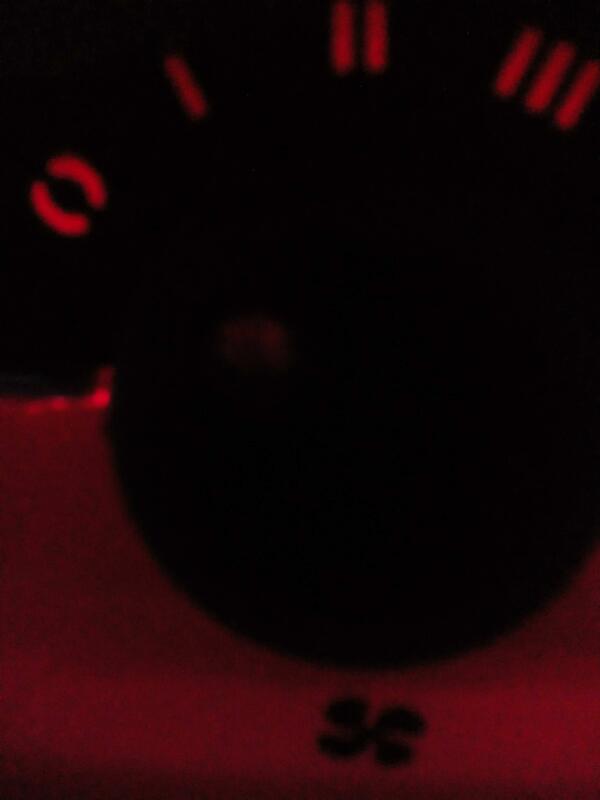 punched a hole in it and fitted it over the centre of the knob with the hole over the original clear one. I thought that I'd married her for her looks and cooking skills but it turns out that she's the brains of the outfit! a photo of it in the dark, illuminated would be nice to see. Nice to see versions on a theme, so you know I'm Steve107 on the other site, as said not my idea, think it came from '107oc' site I member of many years ago, which now long gone. Thanks for the mention in dispatches, Agent Orange. Hi Steve, it's good to hear from you and whether it was your idea or not, I would never have thought of it without your post so, many thanks. Anyway, It's almost dark so I have been out for a look and it works. I must admit that I will probably change the small bump stop for something clearer (less opaque) and the light does show through better at Off and I and III and IV.....It's fairly dim on the II (top/centre) position but it's still better than nothing. Anyway, apologies for the shocking photography but this might give you all the idea of what it looks like at twilight. Do you know, a slightly bigger hole could help at position II as a bit more light could get through....Or maybe drill a little hole in the grey facsia, behind the knob, next to the screw....Go on, which one of us is going to be brave enough to do it!!!! 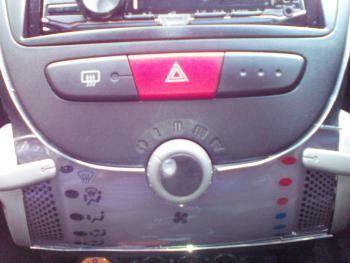 Whilst I'm here, what is that black thing, stuck on your heater panel, please? 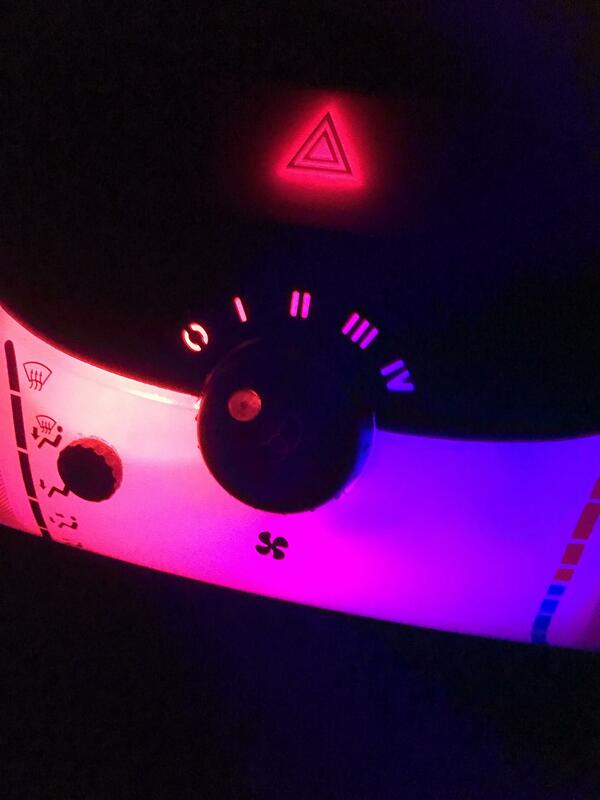 Talking of heater panels, your multi coloured LEDs are a bit tasty....I think I'll stick with my orange lights as they match my car but they look good in yours, Matey! Thanks for your bravery on this one, let's see if we've made the right decision, eh? Thankyou, my original orange bulbs wore out so i fitted the rainbow ones (they are a bit too bright at night to be fair so might change them again. The black thing on the left of the panel is just a concave magnet and on the back of my phone is a convex magnet, so phone holder basically. When i get time i will continue to see if I can improve the lighting re the heating control, Im going to search and fit a piece of clear plastic rod with the theory that it will capture the light from behind and deliver it to the front of the knob if that makes sense. So, a bit of time today.....I don't think I can do any better.......but I got a clear plastic swizzle stick and cut it to length, counter sunk the hole and glued it in place...looks a bit more factory than just a hole....what do you think?? where easy to see at night. Hi Colin, now that looks good! I've been looking around for something a bit clearer, to replace the bump stop on mine and I think that you've come up with it.....A swizzle stick of all things.....Your "Blue Peter" Badge is in the post. It looks like it was always like that, straight from the factory, it lights up better than mine does at the moment and as Mark ( @eygo ) says, it actually looks like a little LED....Well done! I'm sure that we have some swizzle sticks, knocking about somewhere, so I'm going to follow your lead and have a go, myself. 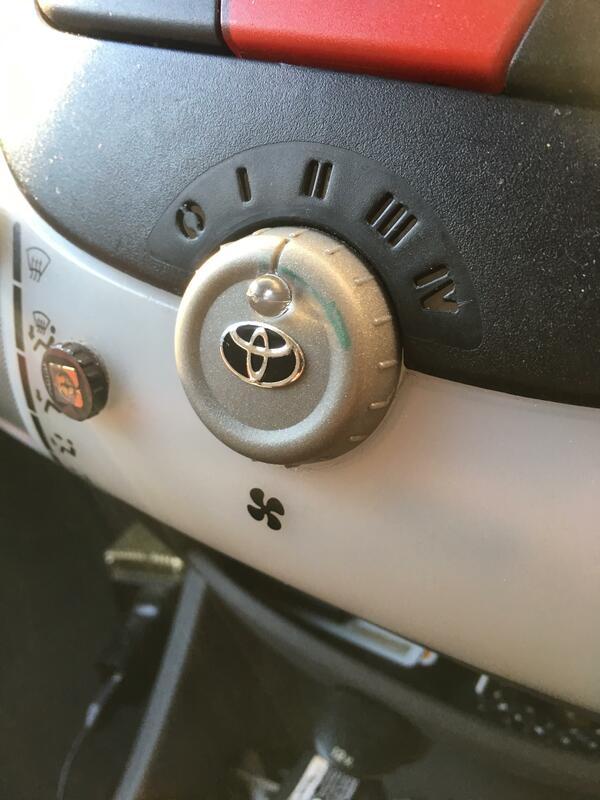 Again, many thanks to Steve ( @Puglet ) for passing on the original idea, and also for his great gear knob conversion, over on the City Bug website.....If you get a moment or two, check it out, Colin, you might just like it....It's a new post, so it's easy to find. Right then, Matey, I'm off to search in various drawers for a swizzle stick, it's amazing how much junk we all accumulate, thinking that "it'll come in handy"...Well this time, it just might! 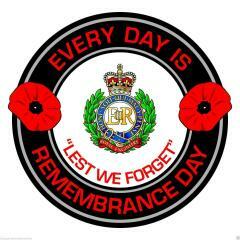 Nice one, Colin and all the best. 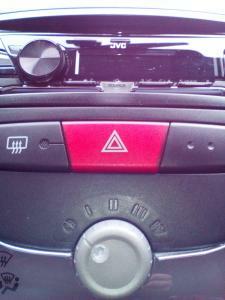 like a fibre optic as essentialy you are using it in the same way. give a clearer & brighter glow on the dial. I chose a clear swizzle stick because of my rainbow bulbs. It only needs to be about a quarter of an inch or so otherwise it will catch, you can use the plastic fins on the inside of the switch as a guide. I had to buy a pack of 12 off eBay for about £2.50 (all clear) With plastic being banned they will become difficult to find, none of the big supermarkets sell them anymore! I simply heated a penknife on the gas and it went through like a hot knife through butter. If you get stuck I'll happily post you a couple. I assume that you mean to polish the cut end of the stick and it's something that I wouldn't have thought of but will really help. Thanks for the idea, as usual you come up with a great tip and helpful advice.....even if, sometimes, people don't appreciate it. I'm glad that our shared experience of a few months ago, with a certain poster, hasn't put you off. The colour is annoying me, but it's given me an idea to add to this. Wouldn't it be awesome, and totally over the top. to change the light behind there to represent the temperature the car is set to? Red for hot, blue for cold, yellow/orange for Juuuuuust right?